Fourth graders at Amity Creek are practicing learning flexible thought via Dr. Carr’s Word Forage. 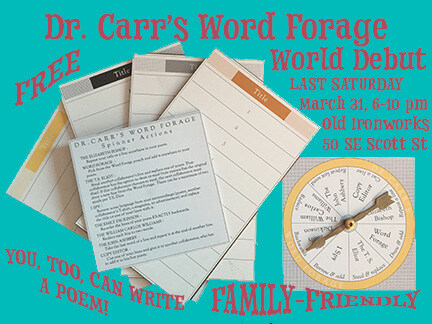 Join us March 31, 6-10 pm, at the Old Ironworks, for the World Debut of this collaborative, chance-based poetry board game. No experience is required and beginners are encouraged. I’ll be running two boards—an adult version, and a kid’s version designed for ages 7 and up and co-created by 4th grade students at Amity Creek! Games at Sparrow, running throughout the evening. Poetry readings 7:05-7:15 and 8:05-8:15 at the Workhouse. Game winners receive signed copies of Dr. Carr’s original work!